THE central business district of Cape Town is fighting back, not only to stem the outflow of businesses relocating to decentralised areas like Claremont, Century City and. INVESTORS have snapped up units in Century Square, an R80m sectional title office block to be developed on the canal overlooking the award-winning nature conservation area at Century City. CENTURY City, situated near the N1 highway midway between the Cape Town and Bellville commercial centres, is close to reaching critical mass as an urban centre in its own right. DECENTRALISATION from Cape Town's city centre needs to be put into perspective, says Tommy Osborne, national property management director of JHI Real Estate. Not for thirty years have Cape Town tenants had such a market for offices. Despite the optimism from SAPOA the rental market is still decidedly in the tenant's favour. 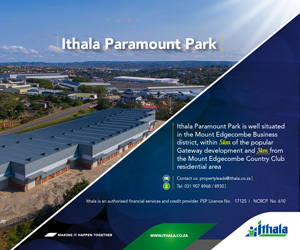 NU-WAY Housing Developments (Pty) Ltd is to undertake a R140 million development in the CBD of Blue Downs which is situated in the south east of the Cape Metropolitan area. MORE than 50 companies have expressed an interest in construction opportunities for the Cape Town International Convention Centre. CONSTRUCTION of the multimillion rand International Convention Centre on the foreshore is seen as the start of a new era of prosperity and economic development for the region.